Support – HPTF and buy from us! ProPenn Marathon balls – $3.49/can or $78.99/case. SCORE AT HAND in stock! 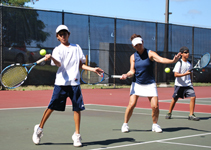 The Hawaii-Pacific Tennis Foundation is a 501(c)(3) not-for-profit organization committed to individual accomplishment and community improvement through the teaching and promotion of tennis. Providing tennis lessons for kids and adults, the Foundation strives to meaningfully touch as many individuals as possible by enriching lives, expanding opportunities and promoting commitment to the community through the sport of tennis. To change lives, we must inspire hope, create opportunities, and places for excellence to flourish. Tennis is for everyone. It offers a fun, active, healthy and social lifestyle for all ages. In particular it provides an attractive alternative to drugs, gangs and violence to impressionable youngsters. To provide opportunities for talented athletes to develop their tennis and academic skills to a level where they can pursue college scholarships.